Acceptance and commitment therapy/training is a mindfulness-based approach to increasing wellness, decreasing suffering, and creating a life of vitality, meaning and purpose. ACT is a process-based approach to learning to observe and describe difficult thoughts, feelings, urges, and sensations with curiosity and compassion, while taking effective and committed action in service of intrinsic values. 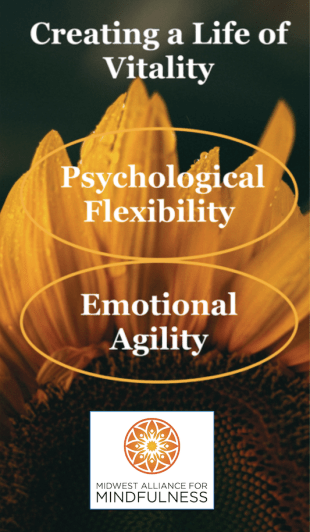 The primary target of ACT is cultivating the skill of psychological flexibility, a concept that is correlated with decreases in psychological symptoms and distress and with increased quality of life. Each class in this 8-week series stands alone, but the learning is most powerful when taken as a complete series. Classes include s a combination of didactic and experiential learning and will also address 1) barriers that make it difficult to “do the know,” and 2) specific examples of how participants can translate the material into their daily personal and professional lives. Bring your meditation cushion if you like – we have a few on hand if needed and folding chairs are also available. 2) Defusion: Is that a THOUGHT or a FACT? 3) Values Authorship & Clarification: What Do You Want Your Life to Be About? **No refunds on or after the enrollment deadline. This course is appropriate for the general public, but up to 16 CEs are available to licensed KS & MO mental health professionals.